The payments, to three individuals and a small New Jersey mortgage company, are in exchange for the whistleblowers’ cooperation in a probe into Bank of America’s mortgage practices in the years leading up to the financial crisis. The whistleblower lawsuits accuse the bank or the firm it acquired in 2008, Countrywide Financial Corp., of misdeeds like inflating the value of mortgage properties and selling defective loans to investors. The payments, which were sent out this week, also underscore how the bank’s purchase of Countrywide continues to haunt the Charlotte, N.C., firm. The allegations trace a familiar pattern, but the whistleblower rewards provide a new wrinkle. 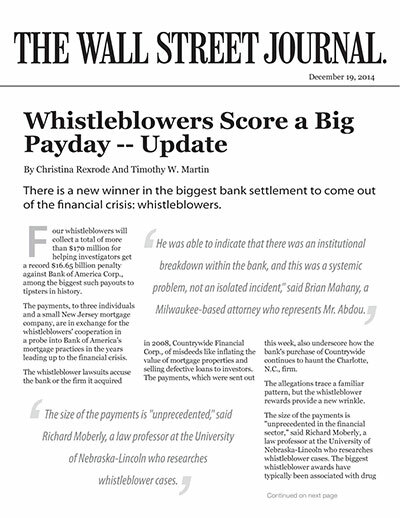 The size of the payments is “unprecedented in the financial sector,” said Richard Moberly, a law professor at the University of Nebraska-Lincoln who researches whistleblower cases. The biggest whistleblower awards have typically been associated with drug companies or health-care frauds, he said. The rewards, some of which were disclosed this week in court filings, are the result of separate lawsuits the whistleblowers filed against Bank of America and were then folded into the bank’s global settlement in August. “These matters have been fully resolved,” a bank spokesman said Friday, referring to the whistleblowers’ allegations. The three individuals will each receive payments of tens of millions of dollars, and the mortgage company, Mortgage Now of Shrewsbury, N.J., will receive about $8.5 million, according to court filings and people familiar with the rewards. Prosecutors and regulators are increasingly making big payouts to tipsters who help them ferret out financial misconduct. The Securities and Exchange Commission in September announced that an informer would collect a record whistleblower award of more than $30 million, more than twice as much as the highest previous award. Attorney General Eric Holder also said this year that he wants to boost payouts to motivate insiders to come forward with useful information. Robert Madsen, a former employee of LandSafe Appraisal, a property appraisal company owned by Bank of America, will collect roughly $56 million, according to a person close to the situation. He had filed a complaint against the bank in 2011. Bank of America acquired LandSafe when it bought Countrywide. LandSafe is among the mortgage affiliates that Bank of America is trying to sell. Mr. Madsen started working there around 2007. According to Mr. Madsen, his bosses started cutting his hours after he raised concerns about properties potentially being overvalued at the expense of borrowers and investors. Mr. Madsen said he initially thought his case was a long shot, but pursued the lawsuit to protect his family. Along the way, he came to view the case as a way to stoke awareness about the importance of reliable appraisals. When “we don’t know what the houses are worth, that undermines virtually every bond, every tranche, every investment instrument out there,” Mr. Madsen said. Mr. Madsen, who lives in Northern California, left the bank around early 2013 and started a company to help banks, investors and other clients identify potential fraud in appraisal work. Shareef Abdou, a former Countrywide manager, will receive about $48 million for his cooperation in the investigation, a person familiar with the matter said. Mr. Abdou is on a leave of absence from Bank of America. Mr. Abdou’s complaint alleged that the bank sold defective mortgage loans to mortgage-finance companies Fannie Mae and Freddie Mac. “He was able to indicate that there was an institutional breakdown within the bank, and this was a systemic problem, not an isolated incident,” said Brian Mahany, a Milwaukee-based attorney who represents Mr. Abdou. Edward O’Donnell, a former Countrywide executive, will collect nearly $58 million, according to a court filing this week. Mr. O’Donnell had originally filed suit against the bank in 2012, with allegations that are similar to Mr. Abdou’s. His lawsuit created the basis for the government’s successful case against the bank over a Countrywide mortgage program called the “Hustle,” which U.S. authorities said churned out large numbers of mortgage loans without regard for quality. Bank of America plans to appeal the Hustle verdict, and Mr. O’Donnell hasn’t received a financial award from the government for that suit, according to his lawyer. The payout for Mr. O’Donnell will come thanks to a separate, similar lawsuit he filed in June against Countrywide and Bank of America. Bank of America bought Countrywide in 2008. It said that the Hustle program ended before it bought Countrywide. The company that filed a whistleblower suit, Mortgage Now, had accused Bank of America in 2012 of misrepresenting loans that it submitted to the Federal Housing Administration for reimbursement, according to one of the lawyers who worked on the case, Clifford Marshall. A combined $1 billion of the $16.65 billion settlement was allotted to the three cases filed by the individual whistleblowers. Their payouts will all amount to roughly 16%.